K/R: BR Textured shell, shorts, and more! What to wear with tube skirt...and new Cons! Angie's fantastic blog post this morning has me thinking, these are all great ways to rein in the looser cuts or oversize fits and make them wearable by more body types. Because it seems to me that loose, unstructured looks are challenging (or feel challenging) to a lot of us. If we are curvy, we worry that they make us look bigger than we are; if we are petite, we feel overwhelmed; if we have sloping shoulders, some things don't stay properly in place, and so on. This is why Angie's suggestions are so brilliant. They help to anchor the looseness and make it wearable. So, here's my follow-up question. Let's say you are wearing a more tailored ensemble. Everything is tailored or even body con. How can you bring a bit of "unstructure" to that look? Example: I am planning (perhaps -- depending on weather, and forum thoughts) to wear a version of the outfit below to my uncle and aunt's 50th wedding anniversary party in early June. It is an afternoon party. The women will probably be mostly in dresses or skirts, but because it's just family and close friends and the venue is quite modest, nobody will be extremely dressy. I will be travelling both before and after this event so I need something that will look good right out of the suitcase. I like this for the ladylike modesty of the neckline and the easy of the skirt. Nothing wrinkles, and I'd feel fine getting down on the floor with a cousin's baby or toddler if it came to that. But it may read as a "work" type outfit to some. Curious if it does to you. And, even if it seems okay for the occasion, is it too 2012 without a bit of unstructure? How would I add that? What kind of topper would do the job? Not saying I am going to spring for yet another new item for one event, but I am curious in general and would love inspiration. Sorry to be a forum hog! I am also posting and running but will be back later this evening to check responses. I just had to share with you. Not styled, but arrived just in time for my trip! When Angie speaks, I listen, so when she said she thought I needed the J. Crew tuxedo shirt, with shaking hands (over the cost) I ordered it. And oh -- it is so beautiful! What wonderful cotton! So soft and luxurious! We all know that Inge has impeccable style sense as well, so when she linked me to the J. Crew boy shirt in the linen stripe...well...I went for that one, too. Here they are, and thank you to Angie and Inge for your brilliant suggestions! 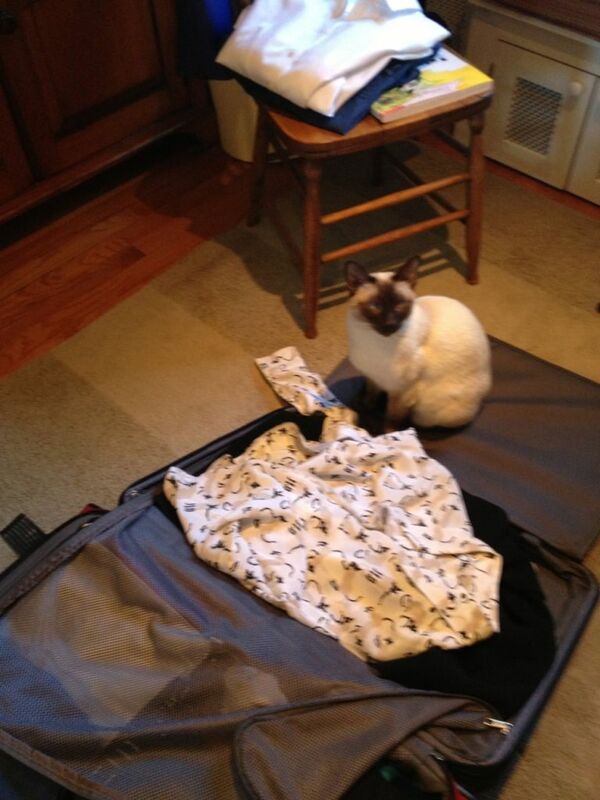 Yes - I am packing again. I counted. Since last March I have been on at least 20 trips (possibly a few more). And that doesn't count the month of February last year, which I spent with my mother after she broke her ankle. Granted, most of these trips have been short visits to my mother (3.5 to 5 hours each way in travel, depending on time of day and means of transportation.) But for me, a short trip can be just as disrupting than a longer one (if not more so). This time, I am off to Banff again for a short writing retreat. And thank to YLF, packing has been a breeze. I know what I'lll be doing, I know what the weather will be like (more or less) and I feel as if I'm well prepared for it all. Counting up the travel time has also reminded me why I actually do need a decent sized "smart casual" capsule as well as a more casual "work-at-home" capsule. With so much time out and about, a couple of leather jackets seem perfectly justified. :-) Ditto all the other items I put into my suitcase this trip. Yes, I need my comfy pullovers and jeans. But I also need something with a bit more flair. I had been feeling vaguely guilty about all the shopping I've done this year. I can afford it. But never having spent more than a couple of hundred dollars on clothes in a year prior to YLF, I wondered if I was being extravagant or foolish. True, I had genuine needs after substantial weight loss. But surely the buying spree has to stop at some point? I want a fairly small, efficient closet, yet having started from scratch, without a clear sense of my own style, and having had numerous purges even in my time here on YLF, I've sometimes been unsure where to draw the line -- either from an ethical or a practical standpoint. So...I would purge something because it wasn't quite right, but then feel guilty if I bought a better replacement, wondering if I really would get my CPW out of it. But now I am feeling a little less guilty. It turns out, I really do wear the heck out of my beautiful clothes! Max is sad to see me go! Some of you know that Rae and I are cat twins. Her Hank and my Max look like brothers. Max was mysteriously ill a few weeks ago. We thought we were going to lose him. Then, just as mysteriously, he recovered. So when Rae posted this amazing Equipment shirt printed with Siamese, I allowed myself a big splurge. Claudia kindly helped me to get the shirt by ordering it from Nordstrom's. Canadians take note: despite the fact that it was labeled a gift, I had to pay taxes on it. Don't ask me why. This seems totally random. The Petty booties I'm wearing came the same way, with no extra taxes. Ditto my Leith pants. But it doesn't matter. This blouse was worth any amount of money to me. And since I am firmly on Team Wear, here it is. Danier black and white bag, new. Thanks to Rae and Claudia for inspiration and help!! No decision yet about the Marisa linen pants, but thank you all for your helpful thoughts. I guess I just need to sit down and make a list of places and I might actually wear lined linen to see if they make sense -- and get Angie's opinion on the length to make them if I do decide to keep. Pics 1-2: First, the BR textured shell in the store. The fit on this is a little snug on the bust (a novelty for me) but a size up will be too big. It did relax a tiny bit just during the try on-take-pictures. I like the neckline front and back. My only question (one that I realize none of you can answer) is when I might have occasion to wear this top. If I worked in an office it would be a no-brainer. But with my lifestyle, I'm not so sure I will have much use for it. It feels too fitted and structured for everyday work-at-home wear. However, I did get it at an excellent price, so really, the question is, would I use it enough to justify even that minimal cost. Or would it simply clutter up the closet. Pic 3: Second, a pair of BR seersucker shorts. These would be strictly for at-home summer wear. But I thought they would be a bit longer on me than they turned out to be. Are they completely age-inappropriate? I wouldn't really be wearing them farther than the park two blocks away. They are super comfortable and the fit is surprisingly nice...sort of easy tailored, if that makes sense. Pics 4-5 A peplum from Loft. It is not as high quality, I suspect, as the one from J. Crew. But that one's on backorder. And I was so in love with K Can's look here that I had to copy. This feels like a keeper to me. Passes the item/outfit/ capsule test and I have ideas for when and how to wear it. I may order the J. Crew one, too. Pic 6 Another Loft tee like the ones in the Marisa photos. Keeping this. Pic 7 BR shirt with my VC cobalt skirt. The top works with lots of stuff and will be super cool. Thank you for looking and for your thoughts on 1/2 and especially 3! Apologies in advance for what will be a few K/R posts. I am genuinely torn about some of these items or I wouldn't impose on you. I'll also show with a few items I'm keeping for sure. First, the Angie pick Marisa linen pants from the Loft. These are fab pants, there is no question. I love the slouchy fit. So comfortable. However, as I realized only after I got home, they are lined. Lined linen seems a contradiction in terms for my summer. Will I even wear them? Not only that, but if they have to be shortened, and Angie says they do, then it will cost more for the alteration. OTOH, the lining helps reduce the wrinkling and it also reduces pocket show through. I must add that Mr. Suz says "You would be crazy to return those pants." Yes, Ladies, he loves them! ADORES them. So that is naturally weighing in the balance. Angie, if you check in, can you please tell me what length they are supposed to be? It's impossible to roll them up because of my calf. I tried to do a few hikes to show shorter. Wearing with the BR silk safari style top. This is a definite keep. It passes the item/ outfit/ capsule test with flying colours and is my idea of a perfect summer top! I also love the colours. I'm carrying a new bag, too -- cobalt!! In the other photos, drapey tees from the Loft. Is the neckline covered enough for me? Hubs is crazy about the blue top. I own two of the VC tube skirts. I haven't been able to wear them yet because I couldn't figure out how to get them to work with tights. But as the weather warms up, they are going to come into their own. I expect them to be workhorses for my wardrobe this spring and summer. One is cobalt and the other is navy. I am wondering what kind of tops will look best with them, so I've tried a few things on so you can compare and help me out with ideas. I do have some limitations when it comes to tops. In terms of figure flattery, I can't really do a wide V neck very successfully, or even a wide scoop (though I am showing one top like this which I quite like on me -- tell me if I am wrong). In terms of fabrication, most polyester tops are out in the summer. Natural fibres are pretty much required. I do not have air conditioning. I would love your thoughts about which shapes work and any that do not. I'm playing with footwear options, as well, and have a few other options. But I feel easier in my mind about those. Oh - I need a handbag, right? Okay...what colour (s)?? Apologies for the mussed hair, etc. And thank you for patience. 1. Cobalt skirt with Gap sweater -- this is a spring rather than high summer look in my climate. 2. Navy skirt with taupe linen sweater. This is also for warm spring, early summer, or early fall, because I need a camisole or tank underneath. In mid-summer, that's not happening. 3. Striped T -- just a normal cheap T from Urban Outfitters. 4. Blue T from BR a few years ago. Is this neckline okay on me? I tend to avoid wide open necklines like this one, but I love this T so much I wear it anyway. (Fabric is really great and cut is loose but shaped - so lovely for summer.) It is a bit dated, I think, and this is probably its last year. 5. Linen button down. Sorry for wrinkles -- it has just come out of its winter hiding place and I haven't pressed it yet. I have several button downs in different colours. This one is a sort of relaxed tailored fit. (Fits at shoulders and top but loose through trunk area.) Others are more tailored through the body. If it is passable, how do you make an outfit like this seem like an outfit? 7. J. Crew T and new baby wedge Cons, shamelessly copying Angie! Too ridiculous for a casual daytime look? 8/9. With denim jackets, since realistically, I will wear these shoes in spring and maybe summer evenings, not in the hottest days of our summer. 10. Orchid fitted cotton top from Mexx. Feels much more fitted than last year, which is partly a few lingering post-vacation pounds, but largely just a change in fit preferences. Realistically, I know I will not wear that belt in the summer. I didn't, last year. I have a couple of other fitted cotton tops from last summer. They were fine for wearing at home but did not feel particularly stylish and do not feel like "unstructured structure." Thanks for looking and for your thoughts. Apologies for yet another review! I am mainly putting this up so I will have a record for myself, so please don't feel a need to comment. Thanks again, Ornella, for your superb organizational skills. Loved doing this, and my family loved it, too. In fact, I think they enjoy these as much as I do! 1. What I would have worn to the premier in 1981. My fave outfit of the week was Star Wars. Technically, the tag is still attached. But after a few hours' wear, I've lost my heart, so it's coming off. Hubs saw them on the bed and said, "I don't know about those rear pockets." Then he saw them on me and said, "Actually, I'm kind of liking those pockets." The bump of excess fabric in the thigh area is adjusting itself with wear. The fabric just needed to soften a little. Thank you all once again for your thoughtful comments. I really enjoyed reading the various points of view and was especially glad when those who didn't like them weighed in. As Angie says, style is so personal. And that's what makes fashion fun. So, the other day I bought the True Religion Cameron jeans in Saratoga wash. They are 100% cotton. There is whiskering but no distressing, and the wash is medium dark. These are a very pricey jean for me. As in very. However, I am taking to heart Angie's advice to put more of my money towards the items that I actually wear on a regular basis, and jeans are the staple of my wardrobe. I figure that if these work out, the CPW will end up very low. But I don't want to make a foolish purchase. Especially in light of Denise's recent post on age-appropriate dressing, I am mindful that I am not getting younger. And these jeans may make me look like I have forgotten that simple truth. I know Denise rocks Camerons like nobody's business. But I think one of the points of her discussion was that what is age-appropriate is individual. Denise always had a rocker-chic side to her style and has probably always been the coolest girl around. Whereas I...well...let's just say that I have rarely heard myself described as "cool." "Classy," maybe. On a good day. My husband commented that these were very different from any other jeans I had ever owned. That was a neutral comment, not negative; in fact, he's a huge fan of the BF look in general and on me in particular, so he won't rule these out simply because they're on the loose side. I think he was reacting mainly to the back pockets. 100% cotton makes them super comfortable. The detailing is really interesting and fun; the workmanship is stellar; they're a huge step up from my GAPS. But I would love to know if they are fitting me the way they should, whether you think they're age-appropriate for me (given my lifestyle, community, figure, etc. ), and if they are a keep, where I should hem these. On me, they're more or less a straight leg jean. I guess they are actually tapered from the knee, but the bottom width is like a straight. I've tried them on with my Report booties and my new sandals. But pretty much any shoe or bootie would do. Is this more or less the right length? I have them turned under about an inch and a half on the uncuffed leg. The cuff I would like to make a bit shorter, but there is too much material to roll it again now. So shortening would help with that as well. But I definitely want to be able to wear these as full length jeans, so if shortening will make that impossible then I will need to rethink that idea. There is a lot of extra material on the inner thigh/crotch area. This is a novelty for me. My thighs are on the large side, so I've never really experienced it, and I wonder if that is the way they are supposed to fit. It doesn't really show all that much in the pictures; I don't know why. Those who own these, is that the way they are? Or maybe it will soften and drape a bit as the jeans soften? They're definitely a boyish cut and I know that is not everyone's cup of tea. But that is not an issue for me. I like boyish. Really, it's all about the details -- whether they are working or whether I should reconsider.